Ron “Bumblefoot” Thal joins line-up as new singer/ guitarist. Original guitarist and former member STEVE HOWE to make guest appearance each night. The dragon has risen again. Two years after the band’s critically acclaimed and successful US trek opening for Journey, an all-new ASIA line-up will return to concert stages across North America as special guests of the YES “ROYAL AFFAIR” tour. The influential British Rock band that rose to the top of the charts with its initial albums and a number of hits including “Only Time Will Tell,” “Heat Of The Moment,” “Don’t Cry,” and “Sole Survivor,” returns with a new line-up that includes founding members Carl Palmer on drums, Geoff Downes on keyboards and backing vocals, and current Yes bassist Billy Sherwood. Joining the band for the first time is lead guitarist and vocalist Ron “Bumblefoot” Thal, an acclaimed solo artist and former member of Guns N Roses for eight years. Thal is also in the prog-rock band Sons Of Apollo. Also appearing on the tour with YES and ASIA, will be Moody Blues member John Lodge and his band and Carl Palmer’s ELP Legacy, with special guest vocalist, Arthur Brown. 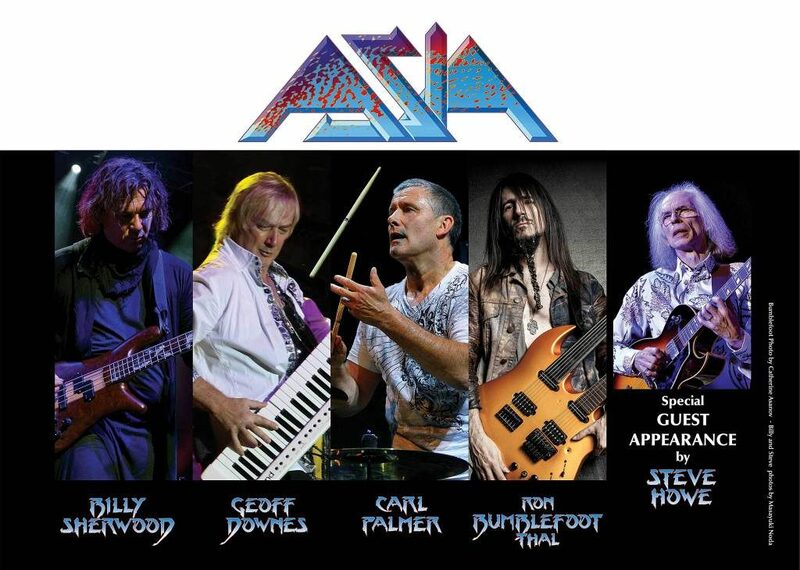 Founding member and original guitarist Steve Howe will join ASIA on stage each night on the Royal Affair tour to play on a few of the band’s biggest hits and honor the memory of his friend, John Wetton. It will mark the first time Howe has performed with the band since his departure in 2013. Asia’s debut album exploded onto the music scene in April 1982, featuring Billboard top 10 classics amongst six radio hits. It became the best-selling album in the World in 1982. Featuring Geoff Downes on keyboards, Steve Howe on guitar, Carl Palmer on drums and John Wetton on lead vocal and bass, Asia was the logical successor to their collective bands of the 70s – Yes, ELP, King Crimson, UK and The Buggles. Asia became one of the most played acts during the first year of MTV. Throughout most of ’82, Asia ruled the radio airwaves and MTV, selling out every date on tour as the debut album crushed all the competition in record stores around the World. The original line-up of ASIA reformed in 2006. It was the first time the four original members had worked together in 23 years. After Howe’s departure, the band regrouped in 2013, with guitarist Sam Coulson and a new studio album, Gravitas, followed. Tragedy struck in January 2017, when John Wetton lost a valiant battle against cancer, just as the band was about to embark on a 43 date tour opening arena shows for JOURNEY. Despite this huge loss, the band recruited old friend bassist Billy Sherwood from YES and completed the tour, triumphantly. In 2018, Coulson left the line-up to concentrate on solo projects, with sincere gratitude from ASIA for his five years of contributions. “There is a great energy when we step on stage,” says Geoff Downes. “We can feel it and I know the fans can feel it.” For ASIA’s long-devoted fans, the band’s return to the concert stage cannot come soon enough.” And Downes confirms: “It is what John would have wanted”. ASIA on THE 2019 “ROYAL AFFAIR TOUR” with Yes, The John Lodge Band, and Carl Palmer’s ELP Legacy with Arthur Brown.